Our annual and widely popular Oakville Annie Bonspiel will be held on Tuesday January 15th & Wednesday January 16th, 2019! Annie is longing to put that golf club back in her hand and head out to the driving range or birdie the 9th hole again. We have some birdie juice waiting for you and Annie! "Swing" into action with us and enjoy 2 terrific sports with us at the same time! The Annie is over for this season. Please check back in the Winter. 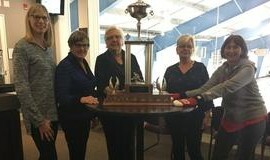 Our annual and widely popular Oakville Annie Bonspiel for Women.